A driver and passenger were injured Thursday when the tire and wheel from a car traveling in the opposite direction on Interstate 5 jumped the median and smashed through their windshield, according to the Washington State Patrol. The car that lost its tire – driven by a 36-year-old man – was going southbound on I-5 near Chehalis during rush hour. The driver’s side front wheel and tire came loose, bounced over the median and into the northbound lanes, striking the second vehicle. Both people in the struck vehicle – a 51-year-old man and 46-year-old woman – were injured. The man was taken by helicopter to Harborview Medical Center in Seattle in critical condition. The woman was taken to Providence Centralia Hospital with non-life-threatening injuries. The driver of the car that lost its tire was not injured. State Patrol is investigating the cause of the crash. Don't fall for the defense theme that tires coming loose from semi-trucks and passenger vehicles and injuring and killing others in the roadway are an "act of God." RELATED: What Is The 'Act Of God' Defense? We’d like to think that when wheels and tires suddenly detach from a passenger car or semi-truck that it’s a freak occurrence. Wheel separations from semi trucks, cars, and buses are still a major problem, although exact numbers are hard to determine because many incidents go unreported. “Wheel separation” is most commonly associated with semi trucks. In 1992, the National Transportation Safety Board estimated the incidence of wheel separations to be about 750 to 1050 per year on semi trucks. Because of the size of semis, it’s not uncommon for a driver to be unaware of the missing tire for several hours after the event. On semi trucks, wheels may break or come loose for several reasons. The tire may be deflated, causing it to overheat and explode. It may have “tread burn,” over-worn tread that causes a tire to overheat. It may be due to tread separation, when the metal and rubber inside a tire disconnect. Or an old, spare tire may rot while in use, causing an accident. On passenger cars, the most common reason wheels separate is a failure of the fasteners, either because the lug nuts fall off or because the wheel studs break. Improper maintenance is a main cause of these problems, and the separations usually occur 2-4 weeks after the service has been done (tire installation, rotation, etc.). Mechanics may not be trained properly on the procedures. They may also only use an air gun to tighten the lug nuts, failing to verify the torque readings with a torque wrench. Every car has specific tire specifications for torque, and only a torque wrench can verify it. When a wheel separates from a vehicle, no matter the size, there is potential serious injury to anyone in the wheel’s path. Vehicles almost always lose control or roll over. These objects turn into projectiles, and if they hit another vehicle, the damage can be severe (as seen in the accident above). When the separation happens on an interstate highway, the bouncing wheel may approach 100 mph. Wheel separation accidents involving semi trucks are complex, as are all semi-truck cases. The potential at-fault parties may be the truck driver (failed to inspect the tires), truck owner (responsible for improper wheel maintenance), or the tire manufacturer (product defects, etc.). A tire from a passenger vehicle that caused injury usually means a third-party maintenance shop or tire repair service is responsible. If a mechanic replaced or did work on a car’s tires and let the vehicle leave with improperly secured tires, they may be held liable. Attorney Chris Davis and the legal team at Davis Law Group, P.S., will investigate to determine who is at fault if you are harmed in a car accident caused by a rolling tire or wheel separation. We will work closely with experts to help reach a settlement or recover in court. 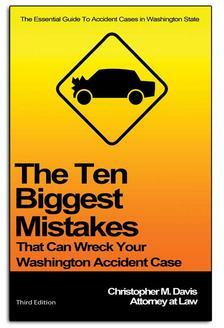 Davis Law Group is based in Seattle and handles personal injury cases across Washington state. Do not hesitate to contact our firm for a free case evaluation. Call (206) 727-4000, use the chat feature below or fill out the form on this page to get started.